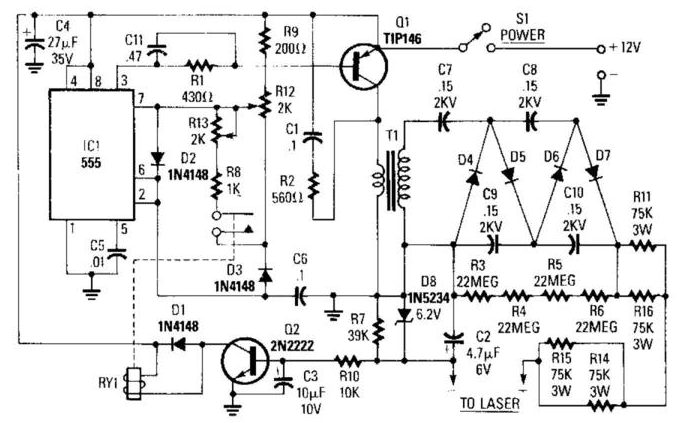 Here is Electronic Project of Laser Power Supply circuit, ICl is a 555 timer running at about 16 kHz. This IC drives Ql, a TIP146, which produces a 12-V square wave across Tl primary. This produces between 800 and 2,000 V across the secondary, which is doubled to 3 to 5 kV. When the load (laser) on the power supply increases, current Q2 is turned on, which energizes RY1. This changes the duty cycle of the 555 timer, lb adjust this supply, set R12 and R13 at the center. Adjust R12 until the laser tube triggers, and make sure that the relay pulls in. If the relay chatters, adjust R12. If the full-clockwise adjustment of R12 fails to ignite the tube, adjust R13.